Peanut butter is one of my favorite foods. In fact, I think I ate it so much growing up that my body started telling me to slow my consumption. There would be days in college that I’d put peanut butter in my oatmeal at breakfast, peanut butter in my smoothie at lunch, then have a peanut butter and jelly wrap at dinner. Whoops. What can I say! 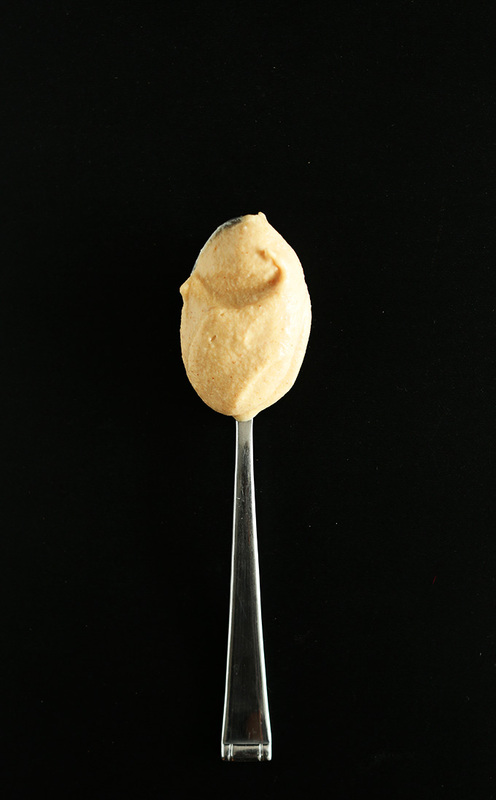 I love this creamy, salty nut butter. So why then, I ask, not make it into a healthy, 3-ingredient mousse so I can put it on everything? That’s what I want to know! I went for agave nectar, but you could also use maple syrup, powdered sugar, or stevia for a lighter option. Whip, whip, whip. Then bring on the peanut butter! 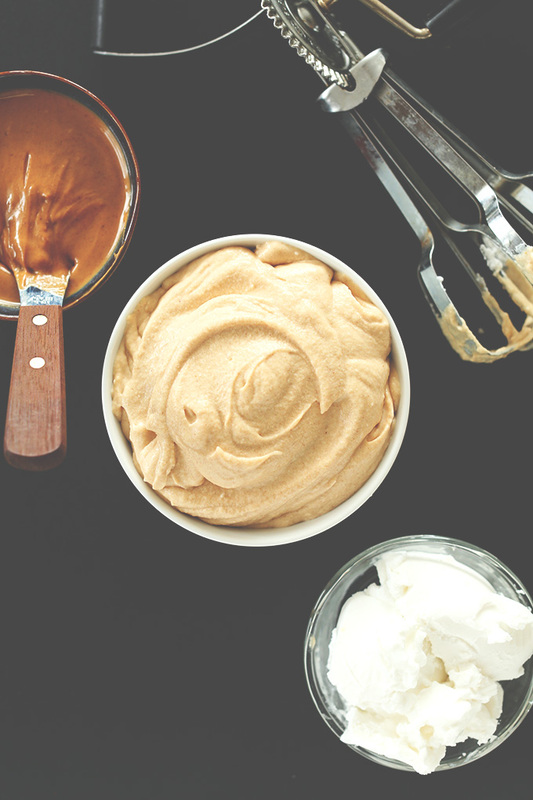 This delicious spread doubles as both a stand-alone dessert – peanut butter mousse – as well as a healthier peanut butter frosting. I would put this on brownies, muffins or cupcakes and go to town. Another option? Protein-boosted fruit dip! Put this on a banana and experience instant bliss. Go wild and put it on everything (including drinking chocolate for the win – yeah I said it). 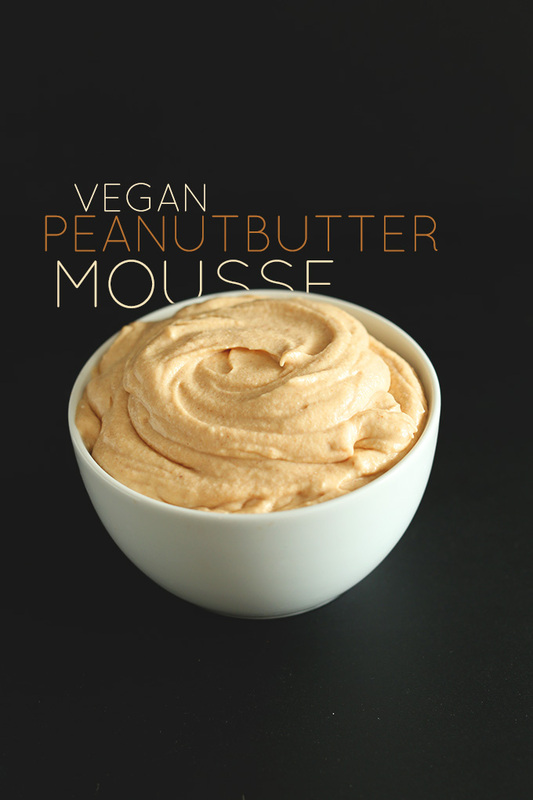 Vegan peanut butter mousse made with coconut milk, peanut butter and a agave nectar! Spread it on cakes, muffins and cookies; use as a fruit dip; or eat straight up as mousse! Using a mixer, beat until creamed together, light and fluffy - about 45 seconds. Add peanut butter, starting with lower end of range (2 Tbsp as original recipe is written) and adding from there to desired taste. Eat as a mousse topped with plain coconut whipped cream, bananas or chocolate sauce. Alternatively, use as a dip for fruit/baked goods. If using as a frosting, don't frost your muffins, cookies and cakes, etc., until just before serving as it needs to be chilled right up until serving. *You can sub 1/2 can coconut cream in place of the cream from 1 can coconut milk. *NOTE: Not all coconut milk is equal. The brands I know and recommend are Thai Kitchen, Trader Joe's (coconut cream, canned), and Whole Foods 365. Other brands source coconut milk from other regions of the world where the coconuts mysteriously have different fat make-ups, which can (and often do) affect the consistency of this mousse. *Prep time does not include chilling coconut milk overnight. I had a leftover 1/2 can of coconut milk from a Thai noodle recipe, and was searching all over to find a SIMPLE recipe to use the rest of it up. Very easy to make (took like 2-3 mins), used a whisk to aerate since I had such a small amount of milk. Added cocoa powder. Very tasty, will definitely be making this recipe again and trying out different variations. 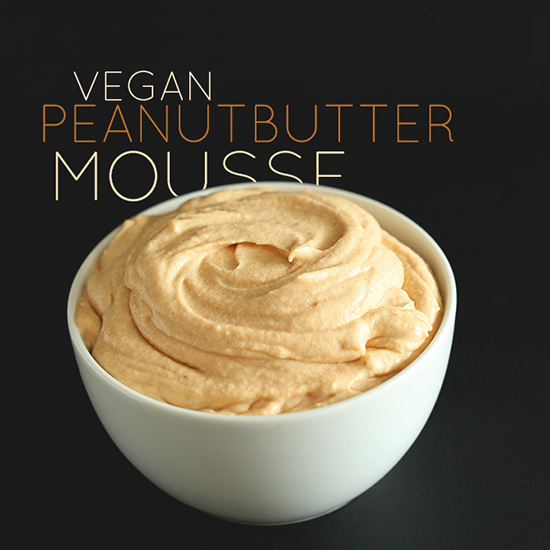 Do you think this could be made with pumpkin puree replacing the peanut butter to make a pumpkin mousse? I am hosting a shower for a friend who is gluten and dairy free, so I thought this would be a perfect dessert. For my trial run I made it for my family. I followed the directions for the mousse to the letter- only adding dark chocolate shavings and crushed peanuts to the top. I served it in small 1/2 cup parfait glasses. My family thought it tasted good, but felt it was more banana forward in taste. We also felt it did not have the consistency of a traditional mousse- it was more creamy like a yogurt and less ‘whipped’. All in all, it’s a great option if you are dairy free or if you just want a light dessert. Adding the chocolate and peanuts to the top will help boost the sweetness and peanut flavor, and the toppings also give it a restaurant-worthy presentation! Yay! We are so glad you enjoyed it, Deirdre! Hi! I have been frantically looking for a vegan frosting recipe for a cake I made on the fly that doesn’t require powdered sugar or vegan butter because of course I’m out. I do have 2 cans of coconut milk. However they aren’t kept in my fridge ? ?‍♀️ and I need to make this ASAP. How does putting a can in the freezer for a little bit do? I have no idea how long to keep in the freezer. I will from now on always keep these cans in the fridge. Otherwise I’m stoked about this. You’ll want them to be as cold as you can get the in the time you have! Hope you enjoy it, Roxanne! If I use coconut cream, how much do I use? 1/2 can of coconut cream! Hi, I was wondering about making this, but I’m not a big fan of the taste of coconut in certain things; will a lot of coconut come through or do you taste it at all? Thank you! This is a great dip for sliced apples too! I recently made this as a dip for a fruit tray I brought to a party. It was perfect!!! Everyone (non-vegans) loved it. Thank you for such an easy to follow recipe with simple ingredients and delicious results ? I made this for Thanksgiving. I made a graham cracker crust (crumbs and earth balance butter) and then topped it with the mousse with vegan chocolate chips mixed in. Then I drizzled mini chips, peanut butter and coconut flakes on top and kept chilled. I cut them into bars and they were SO GOOD!!! Sub an easy recipe and so delicious. I used Trader Joes coconut cream. What if I don’t have a mixer? Would this work in the food processor or blender? Hi. I tried to make this but it never became whip. My milk never solidified. Now I have a runny mess. ? I looked at the other recipe but it didn’t help. How can I thicken it up? Might just be a dud can of coconut milk. When buying, if it sloshes around when you shake it, it’s a dud. Listen for one that doesn’t slosh and is heavy! Sooooo delicious!Too sad I tried to cook a few of your recipes and am too full to eat any more of this lol! I guess gotta share with someone! Can this be frozen and maintain its consistency? Looks delicious!! Do you think this would work as a filling/frosting between chocolate cake layers before frosting? I’m making a snickers cake and wanted a peanut butter frosting in the middle. This is delicious. If I were to make it into a mousse pie, could I cut it into slices and freeze it? Would it lose the texture upon defrosting? Made this today then made a almond flue tart like crust added non diary chocolate chips and spread the PB mousse. It was amazing!!! Making this for friends but I have a question would almond butter work with this recipe too? Is there a way to make this without coconut milk? My mom is allergic to coconut but she loves mousse. Maybe try a tofu filling, kind of like this one only omit the coconut. So good! I had it with chocolate sauce and bananas. Thanks for the recipe! I like this idea. Question. I have a container of home made peanut butter that came out to chunky (i guess i added to much honey). Could i used the chunky butter and still get a smooth fluffy consistency? It will get fluffy, but there will still be those chunks from the peanuts. My poor fiancé is having his wisdom teeth out today and I can’t wait to make him this recipe. I have no doubt it will nurse him back to health! So simple and delicious. I will likely write about how much I love it on my blog :) Thanks so much for the recipe! I’m really enjoying your blog! I got my wisdom teeth removed and my mom has been taking care of me and making me tasty soft foods that I can eat (and enjoy). She made this mousse. It is so good! When she told me it was from Minimalist Baker I loved it even more! Ah, yay! SO great! Feel better soon! I was skeptical when I first came across this recipe but much like the coconut milk become coconut cream overnight I became a believer (possibly an addict) overnight. I used demerara sugar (maybe 1T) in place of the syrup and used only a fork to mix this and it still turned out beautifully! I’m not sure if it’s already been mentioned but the 365 brand from Whole Foods is possibly the best/thickest canned coconut milk. Agreed! Whole Foods coconut milk is awesome! Made the mistake of purchasing coconut cream instead of coconut milk for a salad dressing. Searched for recipes that use coconut cream and stumbled upon this. Peanut Butter. Coconut Cream. Sweetener. DESSERT. Screw the salad, this looks amazing. Serendipity at its finest. Looking forward to making this tonight! Thank you ahead of time! Oh my word. This is just incredible!!! Didn’t need to add a sweetener and added strawberries. De-light-ful! Thankyou!! I almost ended up in hospital because of you! This was sooooo delicious, I was tempted to lick the bowl clean. If I had done that, there is no doubt it would have got trapped on my face, and I would have ended up an embarassed peanut butter mousse covered mess in hospital. The doctors would try to prise the bowl off my head, but I’d be too busy licking the gorgeous mousse for them to really care. I love peanut butter, but this was unlike anything I’ve ever had before. THANK YOU!!! Hmm, it may just have to do with the brand you get as different coconut milks have different levels of fat depending on the region (so I understand). either way, glad you enjoyed the recipe! This looks incredible! I want to use it to frosting cupcakes for a recent vegan’s birthday party. Can this frosting sit out on the counter at all? Or does it need to stay refrigerated? Mm, it needs to stay refrigerated, so I would recommend frosting them just before serving! This sounds amazing! So the TJ’s by me is out of coconut cream, so I bought real dairy cream instead… Can you possibly recommend how much I should use in place of the coconut cream? I’m hoping to make this tomorrow for someone’s birthday! 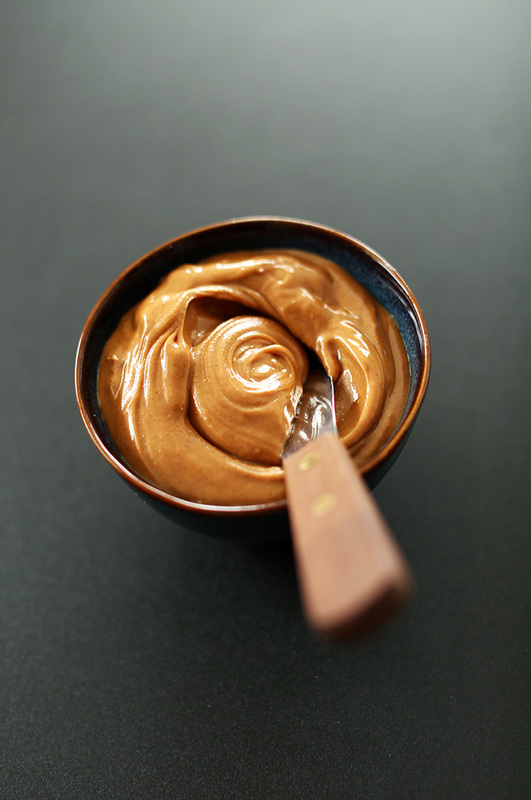 made this will nutella instead of peanut butter and holy moly…in absolute heaven! thank you for posting this! Success! Thank you for this simple and delicious treat! Our dairy free daughter loves ya for it! Thank you for posting this recipe; I am very excited to use it as a frosting for a new vegan cake I am trying this weekend. I do have one question I was hoping you could clarify. I am slightly confused by steps 5 and 6. Step 5 says to “use immediately as a spreadable frosting” but 6 says “if using as a frosting, don’t frost your muffins, cookies and cakes, etc., until just before serving as it needs to be chilled right up until serving”. Is it recommended to frost the cake and then refrigerate, or don’t use immediately to frost, chill, and then use right before serving? Sorry if this questions seems silly. Thank you for your time. If I were to make this for an upcoming birthday cake, do you think once recipe would be enough to ice a two-layer cake? Or should I double it (and if there’s extra I have to find a way to dispose of, then so be it.)? i made this and it was great… and easy. looking forward to using this as a frosting for chocolate cake. your recipes never disappoint. We LOVE this!! I’ve made it a few times now! I have also found that if I get “Thai” coconut milk, it has 3/4 of the can of firm milk & 1/4 water. I don’t even have to refrigerate it! I do because it tastes better cold & I’m gonna eat it right then lol but I have opened 3 cans with no refrigeration & solid as cold crisco! Thank you very much for sharing this with all of us! It is my new go-to recipe & I send everyone to your website when they ask how I came up with it! It is like a goose-down comforter! Pure decadence! I just made this and it’s sooo good. Did you make a mistake in the number of servings? Try this and sprinkle chocolate chips in it delish! I think the only other options would be using whipping cream or silken tofu. Maybe avocado but it’ll give it a funky color/taste. What an amazing treat, peanut butter is my favorite food. So my question is, I’m allergic to coconut unfortunately what can I put in place of it that is dairy free. WOW. looks incredible! So if I use coconut cream, does it still need to be refrigerated? Or can I just whip coconut cream straight off the shelf? I’ll be making this tonight and serving it on top of sliced banana! Yummo! It’ll be more thick if you use it refrigerated, but it should work either way. Just be sure to refrigerate afterwards so it can set! Thanks for this, it turned out perfect for a great treat. Pretty sure it got me some bonus points too! I made this and thought it was good and then….I had some after it had sat in the fridge all night and this went from good to mind blowing! I loved the magic of how the fridge turned it into an airy mousse and the peanut butter flavor really stood out. Wow. This ones a keeper, thank you for sharing!! I do not have a mixer. Can this be successfully created in a high speed blender? If so, tips? I think so! Especially if it’s a small blender, like a bullet. This will give you the whipping you need. I made this for the hubs and I the other night. It was really great. I left my coconut milk (Sprout’s store brand, organic) in the fridge but it didn’t thicken. Since this was my first time using it I wasn’t sure if this was okay or not. I ended up whipping it for a long while and then added the peanut butter (a lot of it, hehe). It set up just fine after a stint in the freezer. Thanks so much for the recipe! I love peanut butter soooo much, and this looks so good. It’s times like these when I really despise my coconut allergy! Looks like I’m gonna have to take your word on how good it tastes. This would be great layered into a trifle, and a possible way of getting some nutritious calories into my elderly mother. Also, I am considering a savory version that goes in a Thai direction, with green onion, chilies, & lemongrass, to accompany spring rolls or even dollop into soup or on top of curry/noodle dishes. Or as a veggie dip. The possibilities are endless… I have a can of coconut cream, gonna make a double batch (unsweetened) and experiment. Thanks for the great inspirational idea Dana! Made this and YUM! Used Pb2 powdered chocolate peanut butter to save some calories/oil. It is great to dip fruit in, but I also smeared some in between graham crackers and put them in the freezer- yum dessert! Glad you enjoyed it Mary! Thanks for sharing your modifications! Can I use coconut milk from a carton? If so, how would I go about it? Nope, it has to be full fat canned. Thai kitchen, Whole Foods 365, or trader joe’s are the best brands. 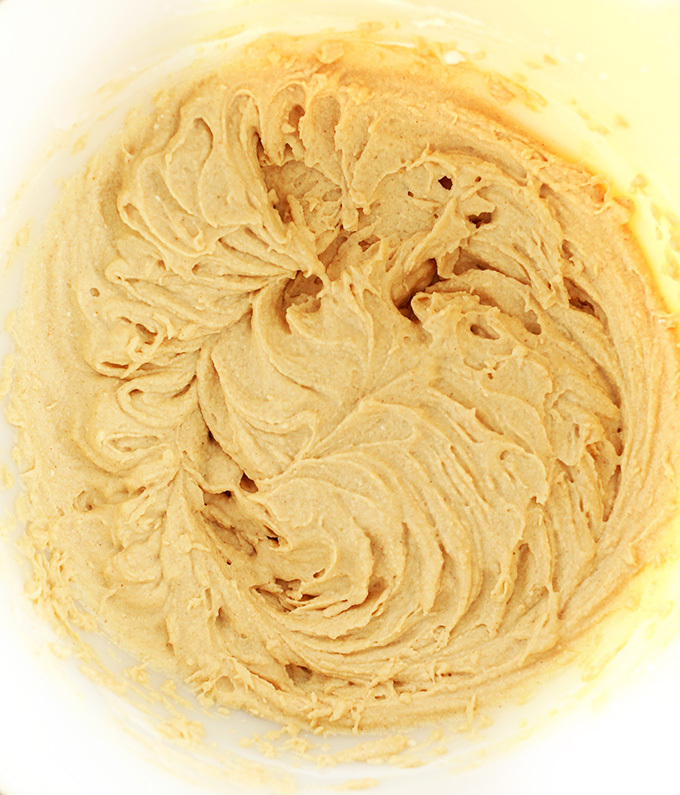 I just discovered your blog this afternoon and have spent two hours looking through it, picking out things I cannot wait to try, but first I made myself a batch of this peanut butter mousse and it is to die for! After a few spoonfuls I added oats and rolled the rest into energy bites for the week – and it was a nice twist. This website is beautiful and I love how you write about and photograph all the delicious things you create! Thank you Melly! So glad you found us and are enjoying the recipes so far. Let us know if you have any suggestions/questions in the future! This was seriously good, much better than I expected! I made a batch of gluten-free crepes and layered them with this mousse for a crepe cake. Great for my husband’s birthday – he loved it! WOW! thankyou Google for taking me to your website when I typed in ‘Peanut Butter Mousse’! I have used this recipe (I had to add gelatine to help it set as my can of Coconut cream was sub par and I wanted it to be firmish) in my Snickers tart! Peanut butter with caramel and chocolate….yummo! I just made a big batch of this to top a pie…I think it will be gone by the time the pie cools down. I can’t stop eating it. Amazing and highly addictive!!! I think it would be awesome. Chocolate + peanut butter = perfection. Made it tonight and it turned out perfectly. Thanks for sharing this! Erica, I’ve learned (and will note in the recipe) that not all coconut milk is equal. The brands I know and recommend are Thai Kitchen, Trader Joe’s (coconut cream, canned), and Whole Foods 365. 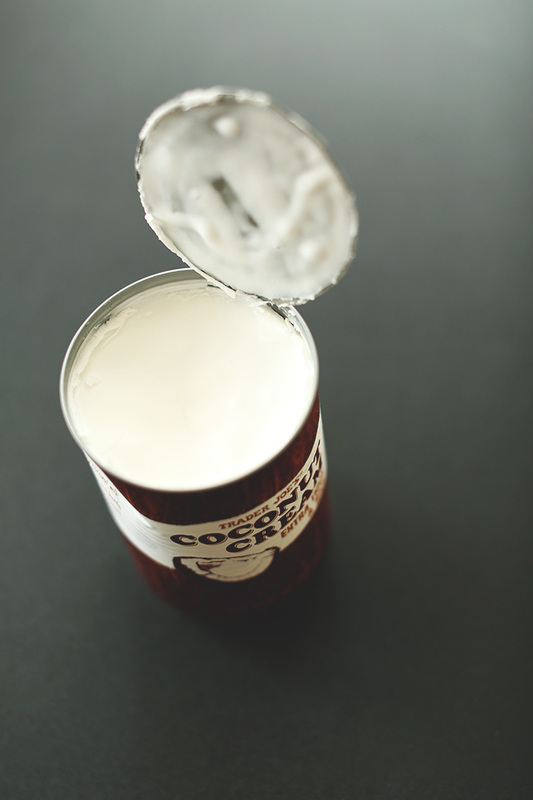 Other brands source coconut milk from other regions where the coconuts mysteriously have different fat make-ups, which affect the consistency of this mousse. Hope you can find one of those brands! This mousse looks incredible! I love your idea for using it as a cake frosting – I will be using this recipe really soon! I just experimented with PB2 and it tastes great – just used same measurements as regular PB. If my calculations are correct, this reduces the calories by quite a bit. I just did the Weight Watchers points – 5-6 points per 1/3 cup with regular PB vs. 3-4 with PB2. Is there anything I can substitute the coconut milk/cream for? I will be making this into a peanut butter pie tonight! With chocolate graham cracker crust! Can’t wait. This looks so yummy!! I’m not allergic to peanut butter, per se, but sometimes I can’t eat it… Do you think this might be possible with something like almond butter? I’d love to try this but the fat content seems really high :( is there an alternative to coconut cream that can be used? Isn’t coconut cream good fat? Erica, there’s a lot of debate over that but I believe yes. I’m in the ‘bring on the coconut’ fat because our body processes it differently than other saturated fats, and most believe it even boosts metabolism among other benefits. Will other non-dairy milks whip? Or does it have to be coconut? In past vegan baking experience, I’m pretty sure only coconut milk will work because it has the appropriate fat content, and in that case only full fat will work. But maybe tofu would work instead! Wow, this look like “heaven on earth”! Didn’t even know I could whip coconut milk/cream. You are my hero! My family will love it. Do you mind if after making it I share your recipe on my blog, giving credit to you and backlink to your beautiful blog? Dana, I made it today. It has been a delicious adventure. The coconut cream did not want “to cream” but in the end, working with handheld mixer + blender helped. It’s absolutely delicious. I thought it was amazing “freshly made” but wowwwww after chilling in the fridge is soooooo good! Looks uh-mazing!! For a lighter version I’ve tried peanut mixed with applesauce. 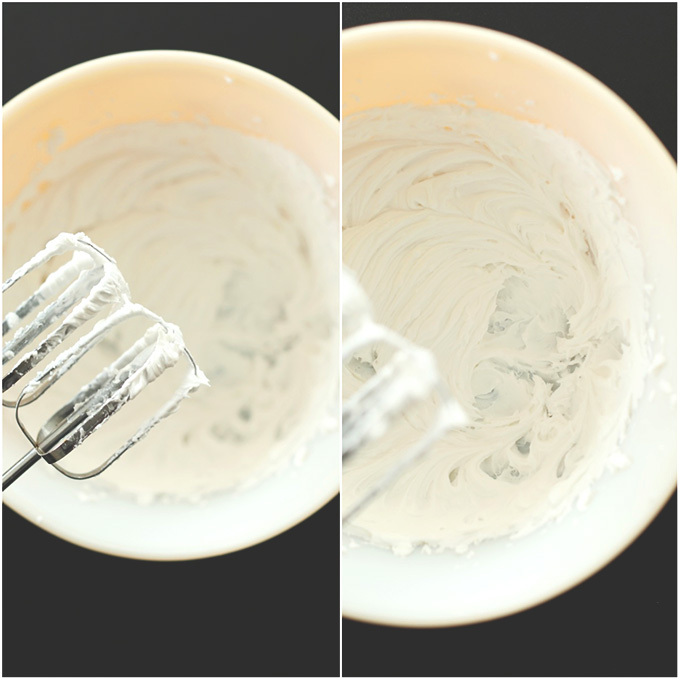 Whip it until it’s combined and it creates a mousse like texture that’s pretty figure friendly. Sorry for yet another question, but is thia doable with an electric mixer? yep! That’s what I used. This looks delicious and easy enough that I could probably handle! Well, actually a crunchy peanut butter lover to clarify!! Oops! haha, me too! I actually did the same thing last week at the store. 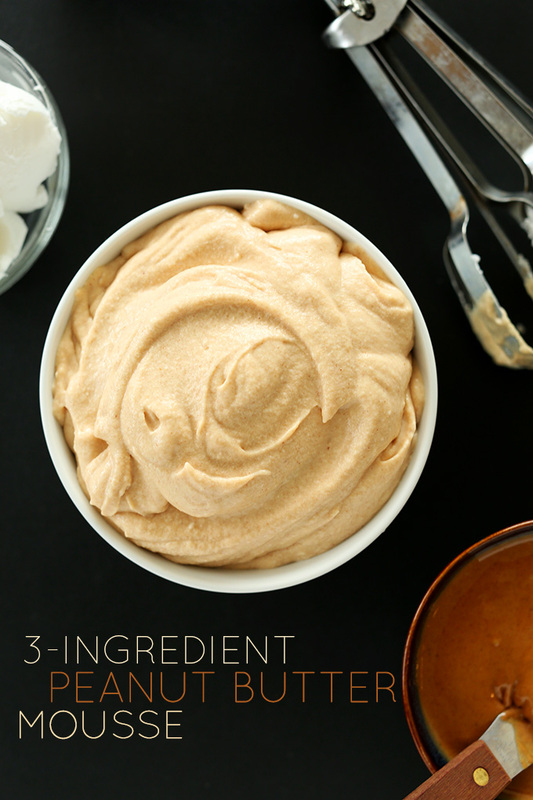 I like creamy for Thai peanut sauces and of course, mousse! Hope you enjoy! I am a crunch peanut butter lover, but I accidentally picked up a jar of smooth last week – here we go!! This looks absolutely AMAZING to the nth degree, Dana! YUM! Genius! What could be better than a peanut butter mousse? I love that this uses coconut milk. I’m sure it tastes phenomenal. It seriously does. Thanks for the kind words, Megan! I have a can of coconut milk in the fridge, I know what I will be making as soon as I get home! There was a solid year when I ate nothing but peanut butter mixed with greek yogurt for breakfast, maybe with an apple dipped in. SO GOOD. This reminds me of that (only better, now that I don’t eat dairy) — a must-try! Yes! That would work. I just can’t do it with my dairy sensitivity, but I bet it’d be lovely! I can’t wait to try this. So simple, but I’m sure it’s delicious. Well this takes eating a spoonful of peanut butter to a whole new level. I’m pretty sure I would just eat the whole dang bowl. Maybe even without a spoon, cause I’m crazy like that. Okay you guys need to make this into an actual product. It’d fly off the shelves!!!!!!!! #truth #nextproject? Niiiice! Peanut butter is such a versatile food so don’t feel one bit guilty about having it all the time, I think it was meant to be served that way. Looks relish, I love a mousse for a lighter dessert. Pinned! Hi! We live in southern Ontario. Kinda near Toronto and very close to Niagara Falls. Come haaaaaang with meeeee! I, too, eat peanut butter almost every day. It’s a big protein source for me, as I don’t eat a huge amount of meat. Also a must in an athlete’s diet. This mousse looks amazing and I look forward to trying it. Yum! I’d love eat this as dip with apples. Sounds delicious. I want to eat ALL cup of this product, seriously. I know it’s like all of my dreams came true in a single bowl. Hope you enjoy! I hated peanut butter as a child (weird), but now I’m loooove peanut butter (because not liking peanut butter is weeerid). This looks delicious, and I happen to have a can of coconut milk in my refrigerator. Obviously, it is fate. I could just eat this with a spoon! Looks incredible! I’m thinking it wouldn’t be a bad idea to shove some of this is an oreo crust, top it off with extra coconut whipped cream and call it a peanut butter pie. Sigh. DUDE, YES. Please do this, take a picture, tag me on instagram and then shovel it all into your face. MKAY? Nice! I’m gonna try making this with coconut sugar. Sounds awesome. Do it, Zach! Let me know how it turns out, mkay?! Oh my word, I could eat an entire bowl of this. LOVE. Also, what do you use for your dark background? I totally love it! Sophie, great question! A chalkboard. You can see what I use for all of my backgrounds in our food photography e-course.